The PINTAR Mobile Learning Unit (PMLU) is a customised vehicle fitted with various educational tools which serves to reach out to PINTAR Students by taking knowledge to them. The PMLU was the first PINTAR National Programme and introduced in 2009 under the Creativity and Innovation theme. Today, the PMLU has grown to be one of the most anticipated national programmes in the PINTAR Foundation stable. According to PINTAR Foundation’s Chairman, Tan Sri Dato’ Seri Utama Arshad Ayub, the theme for this series is in line with the Malaysia Education Blueprint 2013-2025. “We know that Malaysia is moving closer to the realization of its goal to establish a scientific and innovative society by the year 2020. Thus, we are always looking at ways to promote STEM as an approach and a way of thinking for educators to help students integrate knowledge across subjects by incorporating beyond classroom learning and encouraging them to think in a more logical and holistic way in order to be equipped with 21st century skills. I believe that if we all rally together on this, our younger generation will have a strong foundation to be digital citizens and future innovators in a rapidly evolving borderless world.” he says. 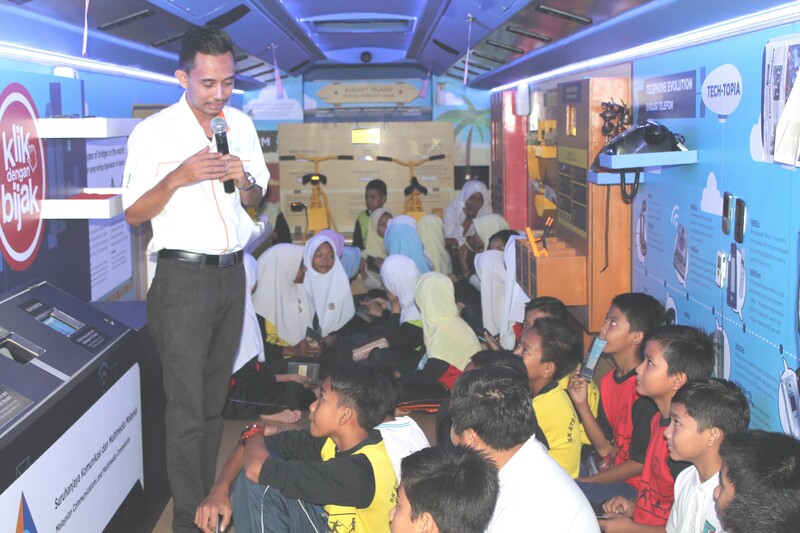 The 'Stemworld' bus features STEM (science, technology, engineering and mathematics) education-related activities to promote engagement, understanding and interest in science and technology among the students. Visitors will be given a Stemworld passport to enter four realms – Scienceland, Tech-topia, Engination and Isle of Math, and they need to complete all activities in a realm in order to get a stamp for their passport before proceeding to a new realm. Besides two informative sections which includes 'Klik Dengan Bijak' that provides awareness on smart Internet usage, visitors can participate in activities such as 'Bridging the Gap' where they have to build bridges for a marble to reach its destination; '3D Printing' where they get to see 3D printed prototypes, 'Tech-topia' where they learn about the telephone evolution, and cycling on 'Budget Island' to earn credits, which, in turn, be used to plan a holiday on the island. The 'Kembara #mydigitalmaker Bersama PINTAR' mobile learning unit, which caters for secondary school children, is fitted with a range of exciting digital making tools, besides information on future digital technology careers and the safe usage of digital technology. Among the activity stations available are coding, application development, 3D printing, robotics, embedded programming and data analytics, all of which will ultimately help to strengthen problem solving and creativity among students. Supported by the Minstry of Education, the #mydigitalmaker mobile learning unit was developed together with Malaysia Digital Economy Corporation Sdn Bhd (MDEC) and other digital technology corporation and industry partners, namely Microsoft Malaysia, Google Malaysia, DiGi Telecommunications, Sasbadi, Designex3D, Cytron Technologies, Janalima, Centillion Robotics, Acestar and Maker21, which showcased the learning modules and content inside the mobile learning unit. The #mydigitalmaker mobile learning unit is part of MDEC's inclusive strategy to motivate Malaysians to support its future generation through the #mydigitalmaker movement. The essence of #mydigitalmaker movement is to transform Malaysian youth from digital users to producers in the digital economy by infusing digital competencies into the formal school curriculum and complementing it with co-curricular digital maker activities and programmes. Copyright © PINTAR Foundation 2014. All rights reserved.